I haven't always been a magazine editor, though I narrowly missed becoming one soon after I graduated from college in 1974. I interviewed at a medical journal near the Northwestern University medical school in downtown Chicago, and turned down the job because it involved scrubbing up and looking over the shoulders of surgeons while they installed new-technology titanium hips, knees, and who knows what else into little old ladies. I turned the job down, even though they were offering me the almost unimaginable salary of $12,500 a year, because I was afraid I would barf explosively halfway through one of the surgeries. I didn't have any luck finding a similar position at a less gruesome publication, so I took a job repairing Xerox machines instead—for $8,700 a year. In a sense I'm glad I didn't take the titanium joint job. The Altair was still a few months off, and I knew nothing whatsoever about computing beyond a FORTRAN course I had taken in high school. I needed to learn a great deal more. Xerox had very good technical training, and I had a chance to hang out with a lot of guys who were building their own computers out of loose parts. I did the same thing in 1976, and wire-wrapped a COSMAC Elf computer from an article in Popular Electronics magazine. It got me underway, and I was never without a computer after the Elf went live. I wasn't a toolbag-toting copier repairman for very long. Xerox promoted me into a couple of jobs that involved tech writing, and then, in late 1978, I got a job programming a slick if slightly backward-looking in-house computer system in an in-house language (DACL) that was an odd mix of 8080 assembly macros and light compilation. After DACL came a project in ABL, and then in Apple III Business Basic. I also did a certain amount of COBOL and TSO fiddling to support the mainframe end of the systems. As 1982 melted into 1983, I found myself in maintenance mode and pretty bored. 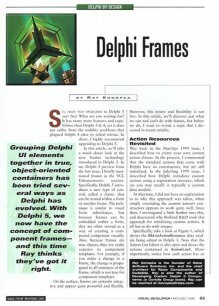 I had had an IBM PC since early 1982, and I started offering PC-related articles to the many computer magazines of the era. I became a regular at Will Fastie's PC Tech Journal, published in Baltimore by Ziff-Davis. In late 1984, technical editor Susan Glinert-Cole suggested I put in for their new tech editor position, which I did, and Will hired me. Carol and I moved to Baltimore in January 1985. The job was wonderful, and I discovered the truth that has been at the core of my personal education program since then: There is no better way to learn a topic than to do a strong developmental edit on a technical article. I learned an immense amount at PCTJ, and got a lot of attention from advertisers because I wrote the "Product of the Month" column. (I didn't choose the products; I just wrote them up.) After discovering Turbo Pascal in 1983, I wrote the second book ever on Turbo Pascal, which hit print in the spring of 1985, followed by a second edition a year later. At the Fall 1986 Comdex in Las Vegas I was buttonholed by Philippe Kahn, who had an interesting proposition for me: To build a new technical magazine focused on Borland's programming products. It was scary: I wouldn't just be working for a magazine; I would be creating it—and then running it. Philippe waved a great deal of money at me—he nearly doubled my Ziff-Davis salary—and I caved. Carol and I moved to Borland country in Scotts Valley, California, in March of 1987. It took awhile to pull things together, but we got our first issue out the door in October, 1987. Turbo Technix was thick, slick, and dense. Philippe thunked a rolled-up copy of Dr. Dobb's Journal on his immense desk and told me he wanted something as big or bigger than DDJ. Turbo Technix was thus never shorter than 160 pages, and because we were never very good at selling ads, there was a huge amount of technical material in every issue. Borland sent Turbo Technix out as a perk to all registered purchasers of any Turbo language. This made our circulation enormous. The final issue went out to 217,000 people, which may have been a record for a programming magazine. I don't know for sure. Alas, the magazine was expensive to produce at that size and circulation, and we were only able to sell 15-20 pages of ads in each issue. Just before sending the seventh issue of Turbo Technix to print, Borland hit a cash-flow bump, and was forced to shed some expenses, among which was Turbo Technix. We cleaned out our desks and went home in late September, 1988. Turbo Technix paid its freelancers well, and I had developed a cadre of superb technical authors during Turbo Technix's short run. My lead author for Turbo Prolog was Keith Weiskamp of Scottsdale, Arizona. Even though I was unemployed at that point, I was addicted to Comdex, and went to Vegas anyway in November 1988. Keith caught up with me in the main hall, and I recall a long conversation with him while sitting on the steps between levels, wolfing down a show dog and some greasy fries. Keith's point was pretty simple, and pretty scary: We could create our own damned magazine—with our own damned money. Keith was at that time designing and laying out technical books for John Wiley & Sons, in New York. He had earlier co-created a magazine called PC AI, which had enjoyed reasonable success and in fact is still being published in 2005. So he knew how it was done, and had the desktop publishing experience to do it. All there was left to do was pull it off. We formed a corporation, The Coriolis Group, named after the volume label of my 44 MB hard drive. We kicked off the magazine project in late summer of 1989. I was still in Scotts Valley, but I started soliciting articles and columns from authors I knew from my previous jobs. We wrote specs and author guidelines and an advertising media kit for the new magazine, named EXE. I flew up to the Turbo User Group gathering near Seattle in August, to give the keynote speech. As part of the speech, I announced EXE Magazine to the attendees' cheers. It wasn't until later that evening that Julian Bucknall, a young British programmer, told us that there already was an EXE Magazine in the UK. Arrgh. So it goes. We had a list of alternate names, and chose PC Techniques instead, capitalizing on the popularity of my earlier mag Turbo Technix. Keith and I began building a mailing list of people who had written fan letters to us over the years, and we mailed a hand-signed letter to all of them (it was several hundred, if I recall) in October 1989. We didn't offer any free issues or anything else. We just told them what we were going to do, and asked for money. 43% of them signed up. We took the money we got from that mailing and rolled it into a second one, which we had built from some Turbo Technix COA cards we had been given and some general cadging from industry contacts. It was about 1,000 names. Again, we just described the mag and asked for money. This time 21% signed up. We took that money and put it into The Big One: A professionally-printed mailing to the entire brokered DDJ subscriber base. If this didn't pay off, we were in trouble. But when the dust settled, we found that 11% of the DDJ list had subscribed (This in itself was astonishing, and probably due to the fact that I had a popular column in DDJ at that time.) Suddenly we were sitting on enough cash to float us for almost a year. We got to work. Keith sat at his Mac in the corner of his bedroom and laid out the articles I had edited and sent him. In between layout sessions (I don't think he slept for three months!) he called programmer tool companies and sold ads. We bought some art from an artist Keith knew. For backgrounds, we borrowed some marble tile samples from some guys at a carpet store and scanned them. Carol and I moved to Phoenix in February, 1990. By then the first issue was in flats, and the hard work was done. Early in March, Volume 1 #1 of PC Techniques hit the mails. We kept the subscription postcards and mailers going out, and before we knew it, there was a second issue, and a third, and a fourth, appearing bimonthly. In late spring 1990 we rented an office in Scottsdale, and hired a layout artist. Keith then focused on ad sales and business management. Carol did the accounting. I kept the articles coming in, and mailed out a monthly author newsletter. For five years PC Techniques rolled on. Keith pulled in some book layout work from major NY publishers to keep our staff busy on slow days, and we began selling various books that we had written mail-order. The Coriolis Group grew. Come 1995 I had a sense that DOS programming (which was PCT's major emphasis) was petering out. Windows 95 appeared, as did Borland's Delphi and Visual Basic 3. Everywhere we looked, software companies were releasing visual development tools. I had the feeling that we needed to bend with the times to stay vital, and so that fall we redesigned PC Techniques completely—so completely that we changed its name to Visual Developer Magazine. We put "Magazine" in the title so that people wouldn't abbreviate it as VD, heh. The first issue of VDM appeared in March, 1996. We published the 50th issue (counting from PCT #1) in June 1998, and it was an oversized issue dated June/July/August. The idea was to get the bimonthly spread to align with the year; i.e., we would have a Jan/Feb issue instead of a Dec/Jan issue. This made certain accounting matters easier, and was a cool excuse to do a really big issue with a special design. However, the following year circulation began to fall off, and I started to worry. We did a big promotion and mailing later that year (did you get your VDM pocket protector with the alien in it?) and that helped a little, but for me the future was troublesome: Many of the sorts of things that we published were now being posted free on the Web. There came a time in late 1999 that I had to make a horrible decision, and we pulled the plug on VDM late that year. The final issue, #60, appeared in February of 2000, dated Mar/Apr 2000. (If you were on the magazine team at some point and I missed you somehow, drop a note and let me know.) I never had such a team before or since. It was a wild ride, and a good one. Again: Thanks, everybody! The links below are to material I wrote for PCT and VDM between 1990 and 2000. "BEGIN" and "The Vision Thing" were editorials; "END" and "Breakpoint" were "last page" essays, meditations, wild ideas, or humor. Some of the files have vanished (bitrot on ancient diskettes!) and so as time allows I'm scanning what remains from my paper copies of the magazines themselves. I have taken what entries have survived from "VDM Diary" and placed them in the Archive section of my Contrapositive Diary. The All-Volunteer Virtual Encyclopedia of Absolutely Everything! Lay Some Skin on Me, Linux! "Dear Sir: Your Lumber Is Ready." If you ever wrote for either PCT or VDM (even one article!) and would like to have your home page listed here, please contact me. I never could have done it alone! Also, if you've posted any material published originally in PCT or VDM, please send me the URLs so I can add them to the list below. The link above is to Peter's page where his entire run of the "Basically Visual" column is available. The link above is to Ray's site, where he hosts most of his columns from VDM.